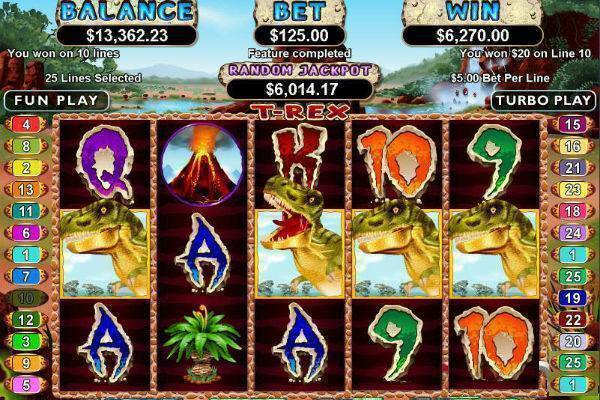 The T-Rex slot is a progressive jackpot from Real Time Gaming, aka RTG. Clearly, the game is all about dinosaurs, with the monstrous T-Rex having a special role on the reels. It’s certainly not the prettiest game we’ve seen, but this 5 reel 25 payline game, with a high RTP of 97.5%, meaning you can be pocketing coins pretty frequently. Of course, the big win is in the progressive jackpot, which is completely randomly triggered and can land you more than a few thousand in your bank account. Check out the prehistoric monster at one of these online casinos. To set your bet size in T Rex, start by choosing the number of paylines you want to bet on via “Lines”. You can bet from 1 to 25 lines. Then, adjust how much you want to bet per line via “Bet”. The absolute smallest bet size per spin is just £0.01 and that’s when you bet on just 1 payline. However, we always recommend betting on as many paylines as you can afford to up your chances of winning. You can see you total bet per spin under the blue “Bet” display at the top of the game screen. Once you’re happy with that, give the Spin button a push, or choose your Autoplay settings. In addition, the Dinosaur Egg is the Scatter symbol. The T Rex progressive jackpot is awarded completely randomly. There’s no special series of symbols or a bonus game to trigger to get that ultimate prize. As with all progressive jackpots, the exact amount you win will vary, but it starts with just a few grand and usually goes up to around £20k, although it has made it to even higher amounts. In terms of the fixed jackpot, the top prize is worth 10,000 coins, and it’s your when you spin 5 – Rex symbols, or 4 Stegosaurus symbols plus 1 T-Rex. Free Games: Spin 3 or more Scatter symbols (the Dino egg) and you will get a round of spins. Each egg will reward you with 10 free spins, on top of a small cash win that’s multiplied by your total bet size. 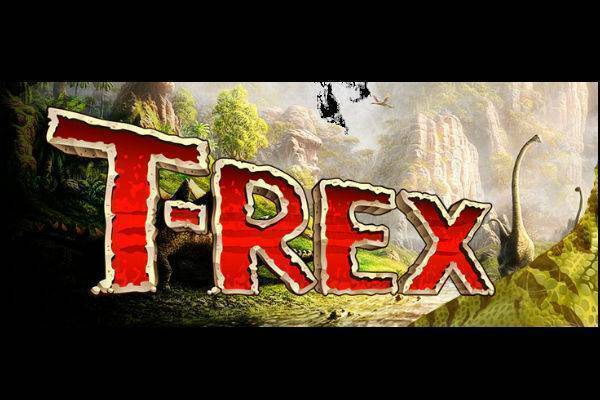 T-Rex Wins: T-Rex is a high value monster that can deliver some of the best payouts in the game. It’s also a Wild that can substitute all other symbols to form a winning payline, with the exception of the Scatter. When there’s a winning payline involve a T-Rex Wild, then the win will be doubled. This symbol normally only appears on Reel 3, but during the Free Games feature, it can expand to eat any other dinosaur that appears and replace them with more high value T-Rex symbols. Alright, so RTG’s dinosaur slot isn’t nearly as slick as Microgaming’s Jurassic World or Jurassic Park. Nevertheless, you got some decent looking dinosaurs here set against a luscious volcanic background. The game is overall colourful and vibrant, and T-Rex is even kind of charming despite his monstrous reputation. The audio to this game is rather non-descript, but it does make us chuckle when T-Rex eats the other dinosaurs. There are several dinosaur slots out there, and RTG’s T-Rex progressive jackpot is one of them. While it’s not horribly ugly, we have to say this is not the most impressive looking dino slot we’ve come across. Neither is the jackpot the most impressive, even though it can add more than a few grand to your bank account – and no one’s ever complained about that. Even though the T-Rex slot is very much average in many respects, it’s still a solid slot with a solid RTP at over 97%, which means you can see some good coins flowing in until you hit the jackpot prize. Play T-Rex at one of these vetted online casinos.